Rigatoni with Eggplant has always been a favorite around my house. Eggplants are low in saturated fat, sodium and cholesterol. The nutritional value in eggplants make it ideal for weight loss. This is a great dish. 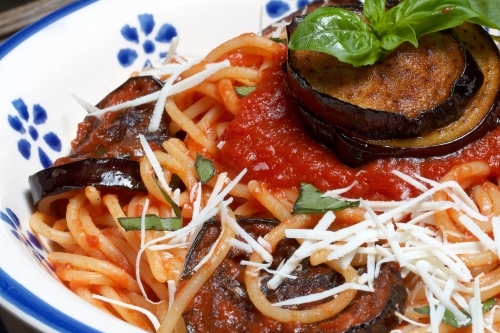 The eggplant is baked then added to a tomato sauce and poured over some nutritious whole wheat penne pasta. This meatless dish is loaded with flavor. You can serve this Rigatoni with Eggplant topped with low fat shredded mozzarella cheese for a little added flavor. Enjoy! Coat the eggplant with 2 Tbls of olive oil. Place the eggplant in a single layer in a baking dish and bake for 15 to 20 minutes until tender. In a large frying pan heat the remaining oil. Add the onions and garlic and sauté for around 2 minutes. Stir in the wine and cook for another minute. Add the diced tomatoes, basil, parsley, oregano, salt and pepper. Cover and cook for about 1 hour on low heat. Add the eggplant to the tomato sauce and cook another 30 minutes. In 6 quarts of boiling salted water cook the pasta until al dente. Around 10 minutes. Drain and plate the pasta and serve with the eggplant sauce on top. You can serve this Rigatoni with Eggplant dish with a little Parmesan on top.